Hi guys! I started this topic because recently I was going through some forums and I found familiar topics. Some girls would start the topic by saying "oh, I'm so in love with Tarkan! he is so...la la la". I want to say I AM NOT IN LOVE WITH TARKAN! but I was always questioning myself what is that??? how can anyone out there feel like it? Such things are really suspicious as for my view. I want to say that yes, I do like Wentworth Miller he is some standard for my dream guy, but well, I can't love him, I don't know his habbits, his way of thinking, talking, his interests...all I know is what magazines tell me, and I can't trust it anyway...so, may be someone wants to share your opinion on this topic? love is oftentimes misused. i agree with francy.. like is more appropriate. as are admire, respect...etc..i love pepsi but i'm not obsessed with it. i love my friends but i don't follow them everywhere... love is a hard thing to define..
On one hand everyone has their own definition of love. So in one sense maybe the do love Tarkan. BUT like Empress said Tarkan is hiding behind that "artist" mask, and probably few only truly know him, so only they are granted to say those true words "I LOVE TARKAN"
Because of Tarkans Triple Threat, good looks, voice, and moves, and also his international popularity, it is easy for someone unstable to fall victim and become obsessed. THen there they start creating and fantasizing, making theirself believe there is a connection and love. I dont want to state anything as if im a psychologist, but I think it is a physcological issue. And if not treated can become quite bad, even creating suicidal thoughts in hopes of a future with Tarkan. I sympathize for those people, because in an ugly world such as ours it is easy to get lost and believe in such a beautiful dream. lest it cause more problems.. i'll just act like i'm the pope of the tarkan church.. 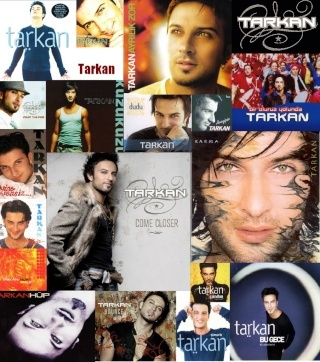 I used to be in love with Tarkan and be all obsessed. It's not a nice feeling. I felt trapped in some irrational behaviour and thought pattern which I could not stop. Fortunately (this happened between 1995 and 1997) Tarkan himself helped me. He had a long talk with me, and told me we would not have a relationship and he encouraged me to get over him, help myself and find someone else. So this enabled me to fall in love with other men and finally get happily married. As a result, I am very greatful to tarkan and will always support him. Also, I want to help other fans who get stuck inside a love infatuation and obsession. How do you know when you are in love with Tarkan? 9. People are telling you to stop talking about Tarkan. Your friends say they worry about you. 10. Physical reactions: the thought or sight of Tarkan can make you blush, go pale, send shivers down your spine, accelerate your heart beat, create sexual arousal, make your palms sweat, make your hands go cold, block your appetite for food, or make you feel otherwise uneasy. If you feel you are in love with Tarkan, or obsessed with him, please do find help within your friends circle or with a psychologist. Obsessions are like addictions and they can be treated just like that. It is possible to bring an obsession to an end. A good self help book is by Susan Forward: Obsessive Love (1991). Actually I don't like it when there are people saying: those who are in love with Tarkan are vulnerable, or psychologically unstable, or are living in a fantasy world. It is not nice to hear such things when you already feel bad about yourself. We as fans should support and help each other. There is absolutely nothing embarrassing about falling in love with Tarkan. He is a loveable man. The only thing is, it is painful and it should stop. I am an intelligent woman and so I know, this is not someting only for stupid people. It can happen to anyone who gets enchanted and who is not completely rational in love, which, to be honest, nobody should be. Come on, it's love, it should be a bit irrational...but not too much hey??? You said it Inge! I had a big problem when I was younger of getting obsessed with men who were unavailable. It took some therapy to get through that. I was looking for someone to fix what I felt was wrong with me. But no one else can fix you. Only you can fix you. I think that a lot of people feel a connection with their favorite artists. It is easy to feel that with the excessive amount of information we get nowadays through magazines, papers, the internet, tv that you "know" who they are. That connection is one reason art touches us as humans. It is easy though to get too involved in it and forget that it is a one sided connection. No star is truly the person they portray themselves to be in public. They have a private side that a fan never has access to. It is easy for people to get caught up in it and to lose sight of the rational side of things. It has happened to many intelligent people and probably will continue to happen as life gets more connected with the web. I love Tarkans music. I think he is a great musician, a great performer and a hottie. But I do not know him, so I cannot love him as an individual. I can love the persona that is Tarkan but not him. Does that make sense? Yes I agree with you very much Dawn. There usually is a sense of need for completion which you feel this person can fulfill. I don't know if I really misjudged Tarkan or fell for his "image". he accused me of that and said I was only in love with his eyes, and that his interviews meant nothing. But until today as I got to know him better, I never saw anything which contradicted my initial feelings about him, and what kind of person he is. Maybe I never got close enough. But I do feel he actually is intelligent and friendly and sociable, and I like him. Of course he makes mistakes like everyone else, and has a down side to his character. However I feel I was really in love with him, only the feelings were not mutual, or he thought it was all too complicated. His words were: we live too far apart for a relationship, its not gonna work out. I don't feel that I was in love with a fictional character which I created myself. Or with his mask or with his image. He said so, but I am still willing to contradict him and argue with him about it. I believe this is a general assumption about fans and pop stars, and this actually also shapes his attitude towards his fans, in the sense that, he disbelieves their affection. He is doing himself injustice. Everyone has an "image" and tries to look good. Everyone has negative sides. Not just pop stars. I believe we, the fans, after all these years, can really like him for who he is, especially if we watch him do the things he does. How many times can you see someone smile and act friendly and be considerate and sociable, and still say, this is just an image? At one moment, all these acts and words do add up to what a person really is. I can't believe a pop star can be one personality on stage and in public, and be the opposite in private. He could be a bit more shy and insecure, but the fact that he is thoughtful and considerate, he showed that so many times, including when he decided to talk with me and take me home. That was not any image speaking, that was him doing something for me. So, I think if you have been following his actions and watching him interact with fans and other people, it would be pretty safe to say that you like him. Don't underestimate human's ability to judge characters on body language and all other clues. I've seen enough. He is a nice person. I am glad to hear that he is a nice person. I do appreciate the values that Tarkan cheers on in interviews and articles. I love that he is working for the environment, that he is encouraging folks to champion peace. I would like to think that he is as nice as he seems, but never having met him, I cannot say. I am glad that he has always treated his fans with respect. Some performers seem to forget who puts them where they are and he seems to always be aware of the power of his fans. That is good. I also like that he treats you with respect. Even when you went to him and discussed your feelings with him, he treated you respectfully and dealt with you honestly. I think that is very good. It shows he has manners and courtesy. Oh God.This is a delicate subject. You know ...there are moments when I watch a video of him and I start criyng..or I don't know just watch an interview and fall into such a bad mood.After that I feel depresed for days...and I'm thinking that I'll NEVER see him...and that my dreams are sometimes painfull. I often find myself dreaming of him...thinking about how beautiful my life would be if I'll meet him one day. I'm shure I'm not the only girl who sees Bilge trought the green glass..I admit sometimes I envy her. I'm obsessed with him. I wake up in the morning with him in my head,,during the night if I wake up (let's say) just to pull my pillow up (it's a stupid example...I know) or just to do anything else, one of his songs is ringing in my head. During the day at work...all I do is think about him...and be so anxious to go home and watch again and again and again his videos...and navigate on the internet and go to diferent sites and search for other videos with him and new pictures of him (and the list goes on). "It's not a nice feeling" (just like Inge sayd)...I hate it. It hurts ...having hin in my head 24/7. I can't do the normal things that a girl my age would do, because I prefer to stay home and watch him and dream about him. If I go out all I want to talk about is Tark' and then ppl around me will start making funn of me and tell me to stop it. your English is fine and I understood you perfecly. Meeting Tarkan is not going to solve your problem, I believe. It never changed my feelings for him. Because Tarkan actually is a very nice person and when you meet him, you will not be disappointed. He is friendly to his fans, he looks fantastic, he even smells great. There is nothing about him that will cause your obsession to stop. The only person who can make this change is you. It is you who has made Tarkan so important. Every hour you give to him, you are feeding your emotions and making it worse. You must spend less time on Tarkan and find other things to spend your life with. If some videos are very strong, then don't look at them. If some songs make you cry, don't listen. When Tarkan told me it would be better for me to stop, I realised that I was not just making myself unhappy. I was also making him unhappy. I thought he would feel proud if fans would love him so much. But he felt sad and not proud. He said he wanted to see me enjoy my life and his music and find someone else. So to hlp myself, I put all my things in a box and did not look at it anymore. Today is more difficult, I understand, because it is all on the computer and you get stuck on the internet surfing. What if you do the following thing to help yourself? This is something you can stop doing. You are a smart person and you can be strong. This is an addiction, you kow it, and you are hurting only yourself. Give yourself free time from tarkan, take a walk outside, go sporting, watch TV, read a book. An this ghost will stop haunting you, I promise. I do have a problem...I'm aware. I'm guilty for this. You are right. I should go out,I should read a book, go see a movie, I don't know...do other things besides staying home and watch him...but I JUST CAN'T. I'm so stupid ..A month ago I started to learn the turkish language...like that will help me in some way. Now I started to draw him... Everything that I do has something to do with him. Oh for Gods sake that will make it ten times worse, dont draw!!! But please relax a bit...it is good that you know you have a problem. You are not in denial. You know that you must help yourself. So that is good, that is step one. You realise this. Just take a break from Tarkan...find yourself again, help yourself, you are worth it! I love those deawings that you made...I just love them. wow!!!!!!! I just logged in and what I see?- a huge discussion on one of the most delicate topics ever!!!! Well, Inge, I knew your story for a long time now, read it on Ali's then blog...I was shocked to be honest, I thought it was some made up story, but after I joined TarkanClub I knew it wasn't just a story it was REAL! You know, I can fall in love (I guess) easily! just like a finger snap, but then the next day my love is gone lol...some of myfriends are laughing at me, cuz I have this problem- I can't love someone fo real and for long, I get bored easily and then I just forget those people and when they come back in to my life again its like "ammm...that's a nice weather out thre LOL"
So if you want to draw, draw other people Youre really talented. I couldn't do that ..pee on tark'??? oohhh Olya fascinating story...it is easy I suppose if you use a tampax for a crayon...that is how I would do it hahahahahaha!!! Hey but MJdiva, what if he asks you to pee on him? What if he actually likes it? Hahahahaaaa!! aaaaaaaaaaaaahahahahahahaha!!!!!! I think I should lock this topic for ladies only this is disguisting poor males who rea it! Subject: Re: In love with Tarkan?